I was watching Bloomberg news on my satellite dish yesterday and during an interview the spokesperson for Consumer Reports magazine said that about 30% of the people who use Facebook in the United States HAVE NOT set their privacy settings and are using the default Facebook privacy settings. In other words, there are millions of people, somewhere around 45 million people, who have a lot of information about themselves, and information about what they are doing, and information about their friends, wide open and available to anyone who wants to see it. 4) The setting is also found under little, little arrow at the top of your Facebook page, just to the right of your name and picture. 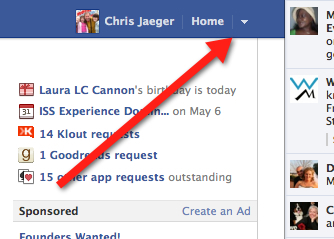 5) Click on the link in the pull-down menu for Privacy Settings. 6) Walk through the options individually and make sure the settings are as you want them to be. The options are fairly well explained. Take your time, read the instructions and examples, and you should be all set in less than 10 to 15 minutes! You’ll also find more information about Facebook privacy here.